Curses, Boiled Again! is a great old fashioned small town cozy mystery. Allie is a ballerina in Boston who recently broke her foot. While recuperating, she is helping her Aunt Gully with her lobster shack in New England. 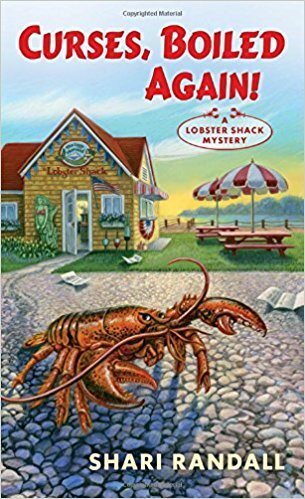 As the book opens, Aunt Gully is appearing on a YUM network competition pitting her lobster roll against three other restaurants. When the judges get sick with the first bite of her competitor’s roll, Aunt Gully is suspected of doctoring their lobster rolls. Allie won’t let her broken ankle or the metal boot on her foot stop her from clearing her Aunt’s name and investigating the crime herself. There are so many cozies these days that it is difficult to find a fresh angle for a new series. However, the new Lobster Shack series has done it. The characters are genuine and different than most. Allie’s job as a ballerina, the setting in a small coastal town in Connecticut, and the lobster profession’s details all make this series unique. As Allie’s best friend, Verity, states, “We have to stop playing Jessica Fletcher.” Please don’t as Jessica Fletcher from Murder She Wrote is beloved by many cozy readers. The information about how to pick lobster, make lobster rolls and even catch lobsters is interesting. Plenty of red herrings and an unexpected twist at the end makes Curses, Boiled Again! an unconditionally recommended read. This reviewer is anxiously awaiting the next book in the series. 4 stars!